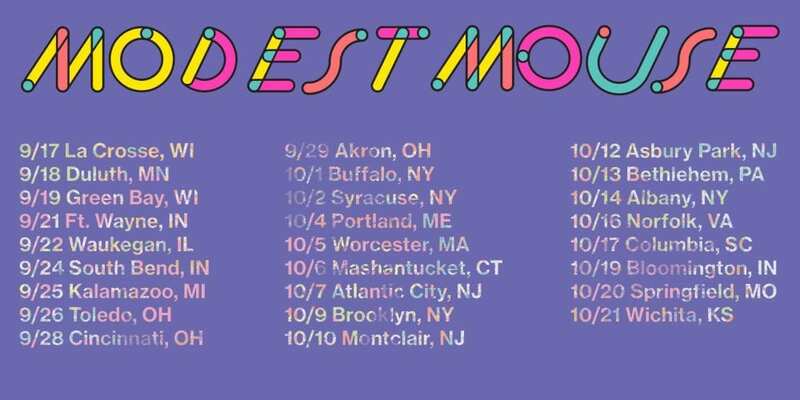 The rockers of Modest Mouse are currently on their 2018 tour, and just announced a slew of additional dates, where the group will make stops across the east coast. This April, the tour kicked-off, and continues through the west. Tonight, they will perform in Flagstaff, Arizona before making six stops throughout California in cities like Big Sur, Santa Barbara, and Oakland. During May, they will be supported by Mimicking Birds. The band will also appear at a couple of festivals, including Sasquatch later this month in Washington, as well as Kentucky’s Forecastle Festival in July. The new tour dates begin on September 17 in Crosse, Wisconsin before hitting big-cities like Syracuse, New York City, Albany, Atlantic City, and Bethlehem. They will wrap-up in Wichita, Kansas on October 21. Modest Mouse are most notably known for their massive hit track “Float On,” which was released on their 2004 record, Good News For People Who Love Bad News. Since then, they have released two studio-albums, including their latest full-length, Strangers to Ourselves. In addition, the group dropped a 6-track EP in 2016 entitled Night on the Sun. According to an interview with Rolling Stone, frontman Isaac Brock hinted than a follow-up album was in the works, but after three years, the band has still not made any indication that new music is coming soon. Visit Ticket Club to find tickets to see Modest Mouse this year.